In the stunning climax to the bestselling Lux series, Daemon and Katy join forces with an unlikely enemy to ensure the survival of not only their love for each other, but the future of all mankind. Opposition will bring forth a new dawn to the Lux universe, where man must stand with alien to survive, and the future, no matter the outcome, will never be the same. 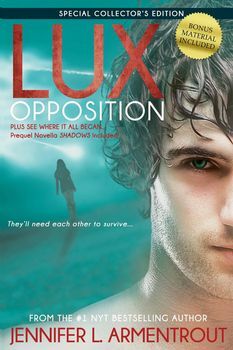 The fifth and final novel in Jennifer L. Armentrout’s bestselling Lux series.